We are very excited to reveal our newest product: The Ambient Microphone Kit. We went live with our Kickstarter today to introduce the AMK to the world. But that’s not even the best part. We’ve decided to go with crowdfunding platform because we want this to be a community project. We want to get your input and make this a product that you and everybody else truly can’t miss. So, what is it? The idea is simple: hear what’s happening around you for convenience and safety! 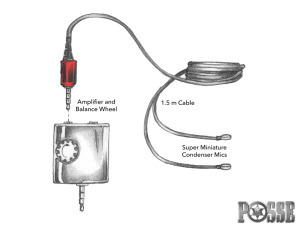 The Ambient Mic Kit is a pair of high quality electret condenser microphones that plug into a miniature amplifier. Together with a set of ear buds or headphones (IEMs included in the kit), you’ll be able to listen to music and hear the ambient sound around you that would normally be blocked out. Anyone who has used the POSSE On Stage Monitoring System knows that one of the coolest features is the built-in room mics, originally designed for musicians to be able to talk to each other, be more aware on stage, and feel connected with the crowd. We took that same technology from our POSSE and put it into a tiny package to create the AMK. Besides the convenience of having your ambient sound easily available, the AMK also makes a great safety device! We are especially excited about this project because it involves YOU! We created a Kickstarter because we wanted the general public to be aware of it and we want your feedback. This isn’t just for musicians, and together we can make something that is universal. We have everything in place to get this made quickly and with your help, we can make a better product, faster. We’ve been playing with a prototype in the office, and it has some amazing effects. When I adjust the balance knob, it feels like I’m adjusting the volume of the world! Have you ever wanted to put someone on mute as they’re blah blahing in your face? With the AMK, now you can! Usually I’ll just be using it to listen to music all day, while occasionally turning on the mics to talk to someone. It’s great, I can turn off the world when I want and if I actually need to hear something, now I can hear up to 100 feet away! It feels really cool! I’m not sure I would call it a super-power, but its definitely a great ability! Make sure to grab an Early Bird or a Fully assembled kit. If you’re just looking to buy a POSSE, we’ve made them available at an unbeatable price of $170, just so you’ll help support the Ambient Microphone Kit.